Packed with powerful sonic punch, the SCX 3H is a rocking machine that's ready to brawl. Burly sound, sleek comfort and the lightning-fast playability Jackson is famous for combine for a high-performance instrument that's an unbeatable value. The stylized take on a classic single cutaway form draws the audience's eye while the powerful sound pummels their ears into submission. A trio of Jackson High Output humbucking pickups powers this engine of musical mayhem, generating complex tones for pristine cleans or punchy distortion while retaining note clarity. A pair of graphite rods reinforces the ultra-speedy one-piece maple neck with Speed Neck profile for rugged stability against warping or shifting. The fleet 12-16 compound radius fingerboard is engineered for comfortable chording in the lower register, flattening out as you move up the neck for firing off leads with easy bends without fear of fretting out. The Jackson fully adjustable radius compensated bridge ensures chords stay in tune anywhere on the neck while perfectly matching the fingerboard radius for comfortable playing feel and accurate string action and spacing. The SCX 3H has all the Jackson eye candy you've come to expect: Jackson branded tuning machines, elegant gold hardware, classic inlays and a scarf-jointed 3x3 AT-1 headstock for optimum break angle at the nut and straight string path for slip-free tuning. An ideal tool for unleashing metal mayhem, the SCX 3H is the latest in Jackson's legendary designs, pushing the guitar performance envelope at a price any wallet can bear. Aside from some minor fret buzz (easily fixed by raising the bridge with a flathead screwdriver). This guitar has some amazing tone to it. Blows my last Jackson (Rhodes) out of the water. I highly recommend this guitar to anyone. 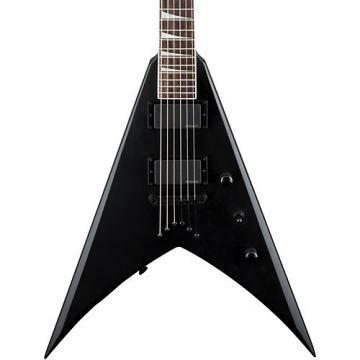 Its a but smaller and sleeker than Gibson or Epiphones Les Paul, which in my opinion would be great for a child. But its not so small you look awkward holding it if you are an adult.